From today, the Horizon Poker Network sites stated that players can compete in a three-step satellite tournament series for the chance to bag a prize package into the Barcelona stop of the PartyPoker Millions Poker Tour valued at $4,500. 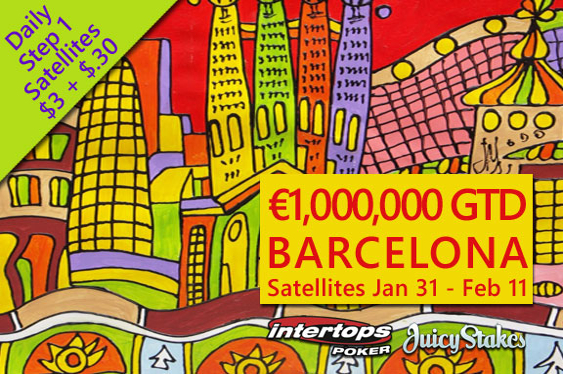 Intertops Poker and Juicy Stakes declared that this award is due to include five nights’ accommodation at the Hotel Arts Barcelona alongside $700 for travel expenses and the €1,100 ($1,366) buy-in for the Casino Barcelona-based tournament’s €1 million ($1.24 million) guaranteed no-limit hold‘em opening event. “Barcelona is definitely one of the coolest cities in the world and this is an amazing event with some ridiculous money to be won,” read a statement from Intertops Poker.